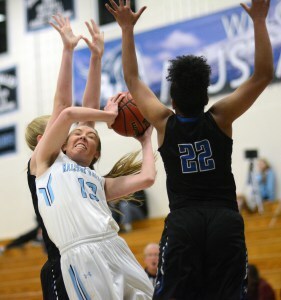 Ralston Valley senior Delaynie Byrne ('18) battles inside during the Mustangs season-opening setback against Grandview, the top-ranked team in Colorado and the defending Class 5A state champions. Byrne led RV with 26 points in the game. Coach Speak: Starting off the season against the defending state champion and nationally-ranked Grandview Wolves, the Mustangs more than held their own. The game was tied at 45 with under a minute to play before Grandview hit a game-winning three pointer at the buzzer to escape with the narrow victory. “Ralston Valley is a really good team,” said Grandview coach Josh Ulitzky. For RV, senior Delaynie Byrne (’18) led the Mustangs with 26 points, including 22 in the second half. “She (Byrne) basically took over,” RV coach Jeff Gomer told Dennis Pleuss of chsaanow.com. “She played us back into the game.” After the Grandview loss, the Mustangs jumped back into action at the Fairview Invitational. In an 81-15, opening round victory over Palmer, ten Mustangs scored, led by Byrne with 18. In the Mustangs semifinal game against No. 2 Cherry Creek, Byrne once again led the way, scoring 19 points. RV received an outstanding game from freshman Sydney Bevington (’21), who scored 16 points in the win. The victory was a bit of revenge as the Bruins knocked RV out of last season’s state playoffs. The Mustangs will play ninth-ranked Fairview in Saturday night’s championship game. Tip is set for 5 p.m.